Planning to include running in your fitness regime? That’s great! Running is one of the best ways to improve your fitness and elevate your mood. It gives your muscles a good workout while increasing the serotonin levels in the brain. Besides, it takes no special equipment to start running; all you need is a pair of shoes and the willingness to run! However, when you are starting out, you might find it difficult to run at a sustained speed for more than a few minutes. Also, you might not be willing to sacrifice a lot of time to figure out complicated running workouts when you’re already hard-pressed for time. That’s why we’ve created our proprietary running training programs, suitable for both novices as well as advanced runners, that prepare you to achieve your running goals in a fixed time frame. The best part about mobiefit running plans is that you don’t have to run every day! With only 3 running sessions per week, you get enough time to relax between the sessions. It is recommended to add strength-training in your schedule on the rest-days to prevent boredom and injury. 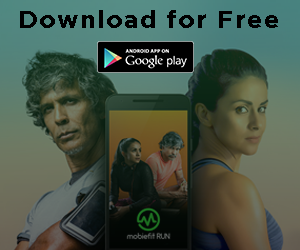 To get started, download the mobiefit RUN app from here on your phone. You can access the full range of training programs and diet plans at just Rs. 125/-month. Select the program as per your goal from the 7 training programs available on the app, followed by choosing your voice coach between our celebrity trainers – Gul Panag and Milind Soman. And that’s it. Now, all you need to do is download the audio instructions and start running! With the intuitive app on your phone, you can swipe to check your weekly running schedule, download the nutrition kit and your tailored diet plan, and browse the helpful resources crafted by top fitness icons to keep you motivated on your journey. 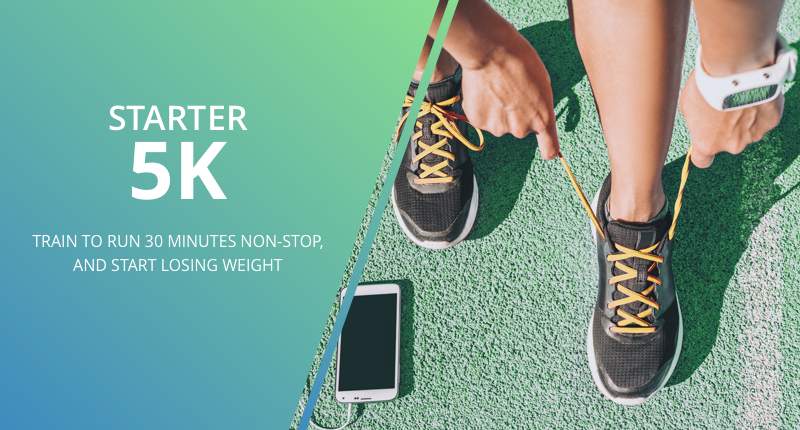 The mobiefit Starter 5K program has been designed for novice runners to gradually build their stamina to run continuously for thirty minutes or complete a 5 KM run. The program starts at an easy pace, progressively building up the intensity of the workouts to build your confidence and keep you motivated. Especially if you are just getting into running, you might find it intimidating to run for 30 minutes at a stretch. However, to help you get there, the 5K plan introduces a mix of jogging and walking intervals to enable your body to withstand the impact of running and get adapted to run for longer periods steadily. By the time you finish 9 weeks of training, we are sure you’d be able to run 5 KMs confidently. The programme also includes a weight-loss diet to help improve your stamina while shedding those extra kilos in a healthy manner. A world-class nutrition guide designed by renowned celebrity nutritionist Shwetha Bhatia accompanies the plan, ensuring you have the right nutrition to fuel your body as you progressively increase the duration and intensity of your runs. The Starter 5K program is a medium intensity running plan designed for novice runners to build their stamina gradually. Starting out with a combination of interval runs and walks, the program slowly advances to longer runs, bringing you to a point where you can run 5 KMs continuously after 9 weeks of training. The first 3 weeks, or your first 9 sessions, combine short, moderate-intensity running spurts with walking breaks. The first 3 sessions of 28.30 minutes each require you to run for a minute followed by 90-seconds of brisk walking, alternately. At the end of the session, you complete 8 minutes of running without ever feeling the strain! A great confidence booster for beginners. In the second and third weeks, the duration of each run is progressively increased so that you find yourself running continuously for long periods. As someone who is passionate about running, you might be aware that most runners fall into 2 camps – those who prefer to run longer and slower and those who prefer to run lesser but harder. However, most experts agree that a combination of running workouts is ideal to build stamina, condition the muscles and improve your cardiovascular system. 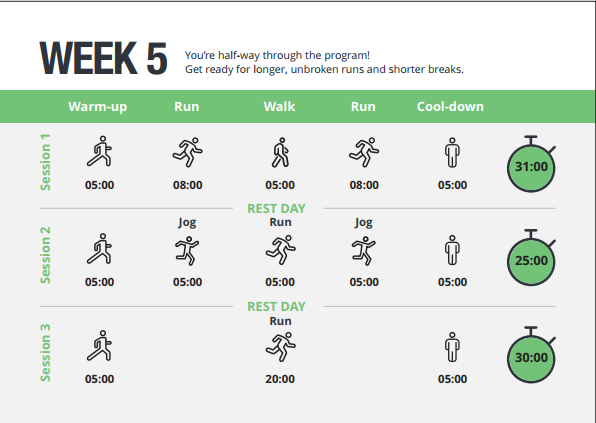 Thus, from Week 3 onwards, your 5K plan includes a variety of running programs of moderate to high-intensity. 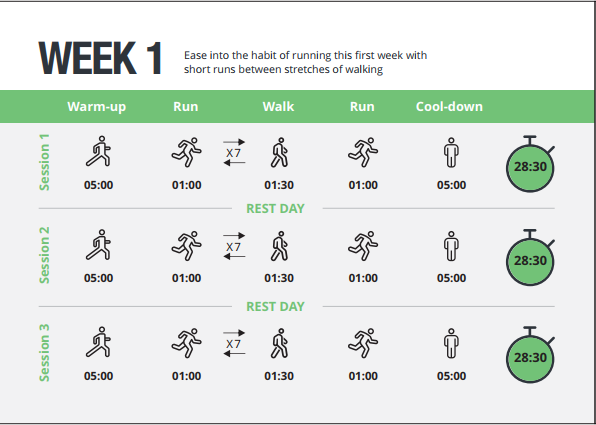 The week starts with a 32-minute run/walk session that combines 4 longer runs (4 minutes each) with walking breaks of 2 minutes, between the regular 5-minute warm-up and cool-down routine. By this time, your body is comfortable running for longer durations continuously. The program, thus, raises the bar with the first high-intensity interval training session in the middle of the week. Interval training is great to burn more calories as well as improve your speed and lung capacity. It involves running high-intensity intervals alternately with less-intense intervals of equal or longer durations. Your very first interval run comprises 5 high-intensity running intervals lasting for a minute each. After every interval of intense running, you are required to jog at an easy pace for 2-minutes to relax your body and prepare it for the next bout of intense training. The total duration of the session, including the warm-up and cool-down routine, is 23 minutes. 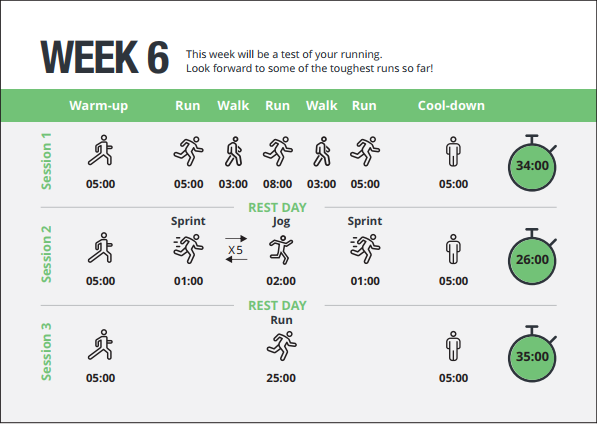 After completing Week 4 with another moderate intensity run-and-walk session, you enter the midpoint of the training program, Week 5, which presents you with your next milestone – your first tempo run. In case you are wondering, tempo runs are crucial to your training as they push the lactate threshold of your muscles, delaying the onset of fatigue, making it possible to run longer distances without getting tired. Your very first tempo run comprises a 5-minute moderate intensity run enveloped between light jogging sessions of 5 minutes each. The regular warm-up and cool down routine applies. The last session of the week celebrates your journey so far by rewarding you with your first unbroken long run. Continuous runs form a significant part of any running program, preparing you to run for longer durations at your natural pace comfortably. This 30-minute session starts with a 5-minute warm-up walk which is followed by continuous running for 20 minutes. A 5-minute brisk walk concludes the session while cooling down your body. In the last week of the second phase of training, or Week 6, the intensity of the training increases as your body and muscles are better conditioned to run by now. During this week, you complete a satisfying 26-minute interval run that comprises 6 high-intensity running intervals of 1-minute each. The last session in your second phase is your longest continuous run so far – a 25-minute long run to test your progress as you complete Phase 2 of the plan and move nearer to your final goal of running for 30 minutes non-stop. 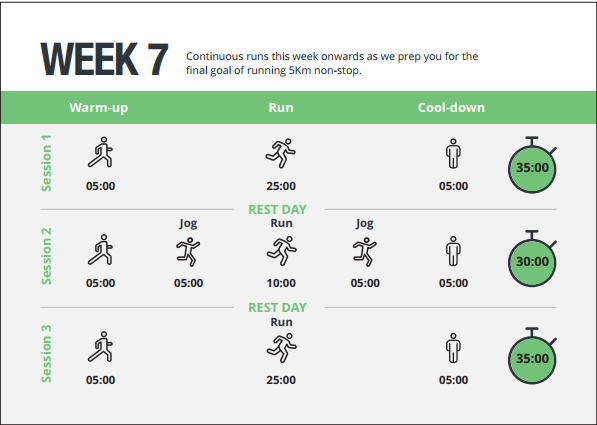 From the seventh week onwards, as you progress into the last phase of your training, more continuous runs are incorporated into the programme to help you improve your speed as well as stamina. Week 7 starts with a 25-minute long run, followed by your second tempo run in the middle of the week. Another continuous run of 25 minutes rounds up the first week of the last phase of your training, conditioning your body to tackle more intense workouts in the weeks ahead. 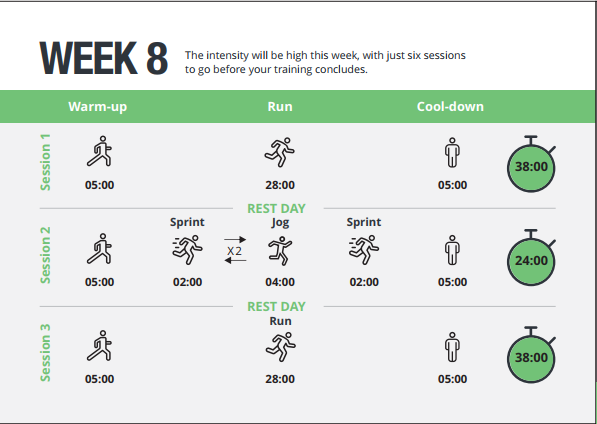 The penultimate week of the training is a mix of workouts with a rigorous interval run enveloped between 2 long continuous runs. After a heady start to the week with a 28-minute continuous run, you proceed to one of the toughest sessions built into the training – another high-intensity interval run. However, this time, the running intervals are much longer, lasting for two minutes each. The 24-minute session can be broken down into 10 minutes for warm-up and cool down, 6 minutes for 3 high-intensity intervals and 8 minutes for 4 low-intensity jogs. The week winds up with another 28-minute continuous run. The last week or the final phase of your training urges you to run for 30 minutes continuously – a goal you can easily achieve due to the past 8 weeks of practice. 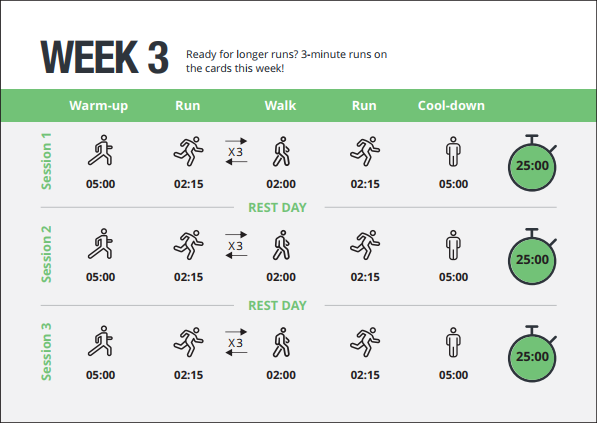 This last week also includes a rigorous tempo run in the middle to improve your speed and stamina for your last and final run of the program – a 5 KM or 30-minute continuous long run. As you can see, the Starter 5K plan starts at an easy pace and slowly builds up the intensity so that you stay motivated to complete the plan! Most running plans tend to be too rigorous or too slow, which could be demotivating or monotonous for many novice runners. Besides, with only 3 running sessions a week, you can choose the days you’d like to run or squeeze in an extra session in case you get busy or miss your workout on a certain day. With a smart training plan accompanied by a nutrition and hydration guide, and a runner’s community to keep your spirits high, mobiefit Starter 5K plan is poised to help you achieve your running goals in a fixed timeframe. 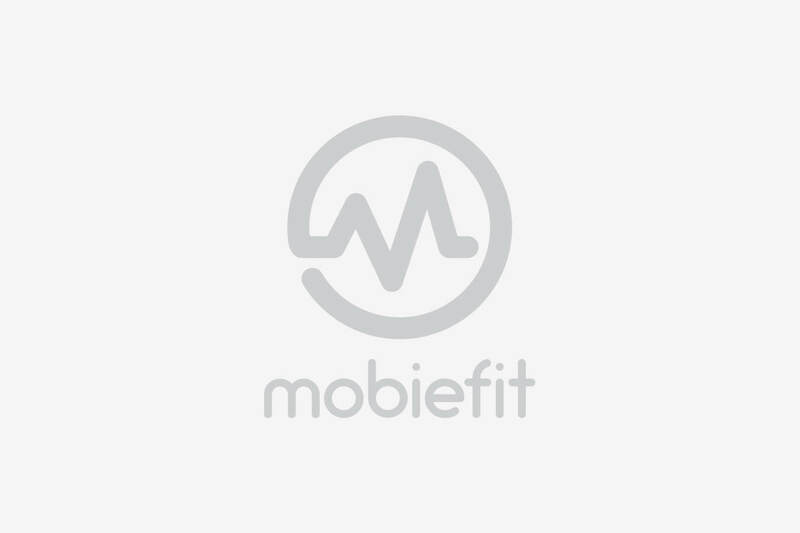 The mobiefit 5k plan is based on the concept of smart training. The plan is designed to incorporate different kinds of running workouts, spaced out with adequate rest days to recuperate your tired muscles. Each training week includes only 3 running sessions and 4 rest days that can be utilised for strength training to maintain muscle strength, prevent joint injuries, and aid fat burning. A strength training guide is provided with the running program that includes runner-specific strength training exercises such as plyometric lunges and squats. These exercises involve compound joint movements and reduce the risk of injury while running. They also help to build endurance. To achieve the desired output from the 5K Starter Plan, it is recommended to follow the strength exercises given in the guide, in addition to the running sessions, at least twice a week. You can also check out the mobiefit feed that features hand-picked articles and videos under categories such as Nutrition, Gears and Gadgets, Running Workouts, Running Icons, Lifestyle, etc. to guide you on your journey and keep you motivated. Each mobiefit running program is accompanied by a diet and nutrition kit that is designed to help users achieve the desired results from the program. The diet plans, scientifically crafted by our celebrity nutritionist, Shwetha, are a cornerstone of all mobiefit training programs. The diet and training programs go together for the user to see optimum results. For example, the Starter 5K programme includes a customised diet plan for each month of training, designed to achieve weight loss and improve running performance. You can choose a vegetarian or non-vegetarian diet built upon readily available ingredients that are tasty, healthy, and cost-effective. The diet plan is accompanied by a nutrition kit that contains a hydration guide, a macros calculator, and other important information on spacing your meals and getting adequate sleep. Apart from listing the foods you must avoid to lose weight, the guide also lays down the supplements you need to take with your diet and at what timings. “This plan is sustainable and can be followed forever. 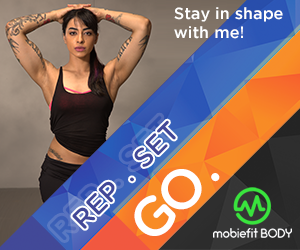 It’s a guarantee of great long-term health,” says Shwetha, about the mobiefit diet plans. Shwetha is quite right in what she says. 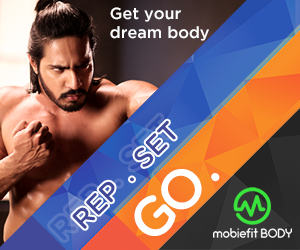 The mobiefit training program and diet are designed to give guaranteed results if followed properly. 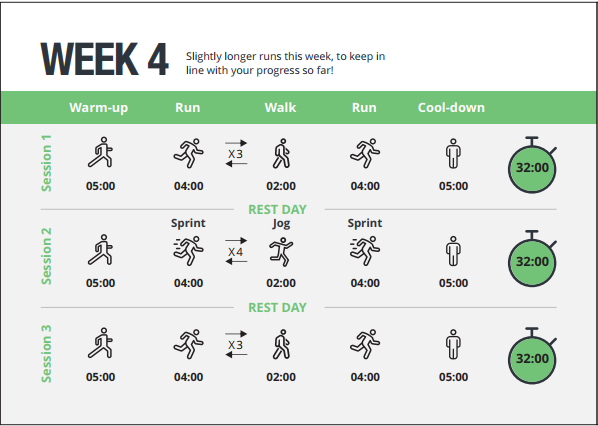 Within a few weeks of starting the 5k Starter plan, not only would you find yourself to be more energetic, but also see your running performance improve steadily. Besides, the well-rounded meals coupled with the training sessions will soon have you shedding kilos and losing inches off your waist in a healthy manner. You can find out more about mobiefit training programs here. A training program for every runner! Mobiefit RUN app has a training programme for every type of runner. In addition to the 5K, 10K and 21K Starter plan to get you in the habit of running, we also have more rigorous Elite plans for experienced runners who want to improve their pace. Besides, if you are training for a marathon, the high-intensity Mission Marathon program will prepare you for a full marathon (42K) in less than 4 months! At mobiefit, we create training plans that give guaranteed results. If you don’t see the promised results at the end of the program, we will return your money without asking you any questions. In fact, we would also return your money if you do achieve the promised results because we are confident that our programmes work! So, ‘run’ to our training page now and browse all the mobiefit training programs to find one that is made for you. We are waiting to see your journey through pictures and share your story with the world to inspire others. If you have any suggestions, do leave a comment on this post or our Facebook, Twitter, or Instagram channels!